In 2005, European old masters generated $655 million of auction sales, compared with $1.6 billion for contemporary works. In 2015, old master auctions had declined to $561 million, while equivalent sales of contemporary art stood at $6.8 billion, according to the 2016 Tefaf Art Market Report. “Return From the Kermesse” by Pieter Breugel the Younger. Such data makes it clear that for the old master market to thrive, let alone expand, it needs to widen its appeal. Sotheby’s and Christie’s, just like the gray-walled Frieze Masters fair in Regent’s Park, have tried to update the presentation of historic paintings. At the old master evening auctions here earlier this month, Sotheby’s hung works against walls painted an almost-black shade of gray, while Christie’s “Classic Week” view, aiming for crossover appeal with eclectic collectors, had rooms filled with old masters (on dark blue) next to those showing Japanese and Surrealist art. 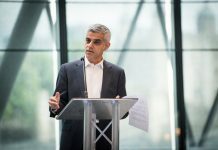 Sotheby’s Dec. 7 auction raised 14.8 million pounds with fees, or about $18.5, million, from 40 lots, with 82.5 percent of the works successful, while Christie’s 37-lot sale the following night took £12.2 million with an 81 percent success rate. Attractive paintings fresh from long-established collections invariably drew multiple bids. At Sotheby’s, a small 1649 Jacob van Ruisdael river landscape that had been in the collection of the Marquess of Lothian for at least 150 years soared to £512,750 against an estimate of £30,000 to £40,000. “The market for old masters is in rude health,” Alexander Bell, Sotheby’s worldwide co-chairman of old master paintings, said in a statement after the sale. By way of perspective, however, the aggregate £27 million with fees generated by the two houses’ relatively small old master sales was 7 percent below the £29.1 million achieved at the equivalent evening auctions last December. Of course, if an exceptional old master work does come up for sale, a spectacular one-off result can be achieved — such as the £44.9 million that a telephone buyer paid in July for Rubens’s “Lot and His Daughters” at Christie’s. 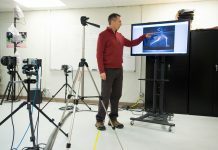 And dealers and salesroom specialists continue to make discoveries. Only last week, the Paris auctioneers Tajan unveiled a newly attributed Leonardo drawing valued at 15 million euros, or about $15.7 million. “Monarch of the Glen” by Edwin Landseer. But this time around in London both houses struggled to offer major works by household names. Christie’s sale was led by the £1.8 million given on the telephone for a technically proficient, if slightly unnerving, circa 1625 Jacob Jordaens “close-up” canvas of the Holy Family with an angel that had belonged to a “European noble family,” estimated at £500,000 to £800,000. 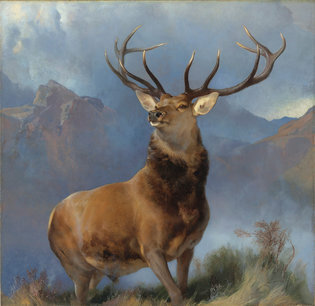 Christie’s total could have been substantially larger if it had been able to offer Edwin Landseer’s 1849 “Monarch of the Glen,” estimated at about £10 million. Unfortunately for Christie’s, the painting was withdrawn after the owners, the drinks company Diageo, and the National Galleries of Scotland reached a £8 million agreement that should allow the painting to be put on permanent display in Scotland. 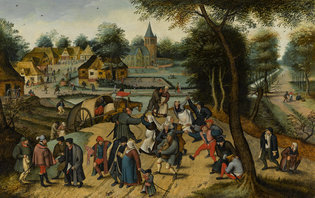 The top-performing work at Sotheby’s was a version of Pieter Breugel the Younger’s boisterous genre scene “Return From the Kermesse,” packed with drunken figures, which sold, again on the telephone, for £2.6 million, or about $3.3 million, at the low end of its estimate. It had been bought by its seller at auction in 2011 for $4.6 million, representing a sobering loss on a five-year investment. High-end auctions of contemporary art have their own supply problems at the moment, but works by desirable names can still routinely make profits for sellers after just five years, or even five months of ownership. By contrast, the trade in old masters, with its thinner client base and paucity of commercial names, places a disproportionate premium on works new to the market. Yet there remain thousands of more mainstream old master paintings in auctions, galleries and art fairs that struggle to attract any interest. Presentation remains an issue. Newcomers to today’s art world can be intimidated by the traditional combination of dark paintings on dark walls accompanied by middle-aged men in dark suits. And how many people actually live in homes with dark gray or blue walls?